Rob Barfitt was on familiar ground when he came into the Church Street School on Friday afternoon. A long-time member of the Aurora Community, he remembers frequent visits to the landmark building to pick up gear as a member of the local Boy Scouts. Now a bit past the Boy Scout age and an active member of his family’s business, Aurora Home Hardware, on his latest visit to the school, he was joined by local business leaders to ring the school’s historic bell, signalling a new chapter in the building’s history to mark the fifth anniversary of the Aurora Cultural Centre. Representatives from Aurora Home Hardware, Backyard Pool and Spa, Omars Shoes, and Promotional Marketing got in their morning workout struggling to make the bell work its magic, but it was all for a good cause as they joined Prime Data Inc. and Remax’s Susan Cowen Team as the foundation members of the 5-50-500 Campaign. To mark their fifth anniversary, the Aurora Cultural Centre has reached out to 50 local businesses for a contribution of $500. They hope to raise $25,000 by the end of this year to support their family activities, concerts, heritage programs, and other activities that are provided free of charge to the community. 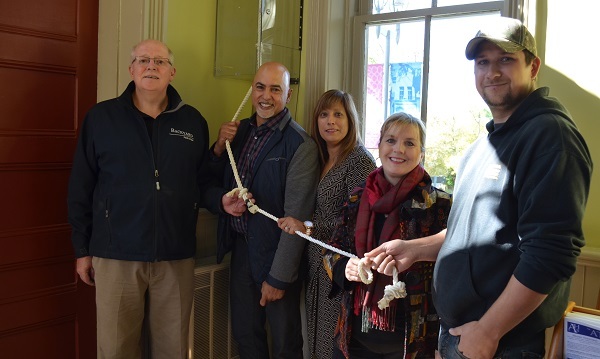 For the sponsors who gathered to ring the bell to signal their contributions last week, the opportunity to support the Cultural Centre was an opportunity to become involved in the community in a different way. The owners of Backyard Pool have always been supportive of community initiatives through their 22 years in business, noted the company’s Richard West, while Mr. Barfitt said it was “great” to support an initiative which has found such a great fit within the building as a hub of cultural arts.